Yay – last minute workshop courtesy of some helpful organizers! No update yesterday, since we were celebrating the birthday of Jon Phillips after the LGM dinner. 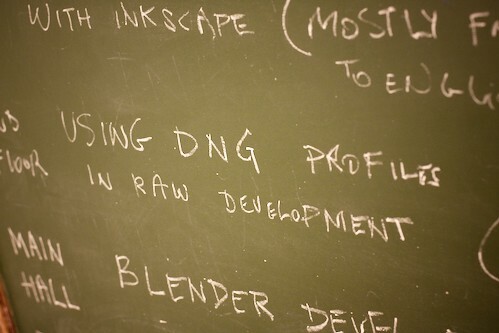 We also got a spot at a workshop today, where we made a small talk about using DNG color profiles in Raw conversion, and why we feel that this is an important step towards having more profiles available to the Open Source community. The main point is, that it would enable us to do profiles that could be used in ALL raw development software, and not profiles that are only suited to one application. We don’t have the time to go into full detail here, but we’ll surely follow up on that soon. Anyway, this was our last day at LGM, since we have to leave early tomorrow. It has been a great experience, and we’ve talked to a lot of great people and heard about a lot of interesting projects.